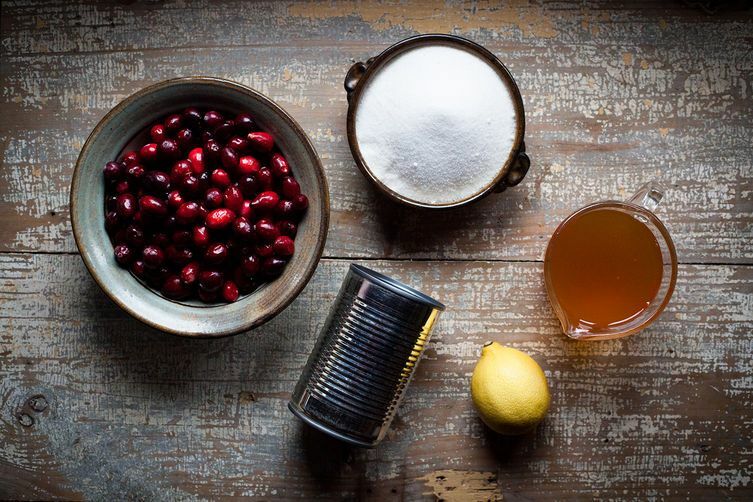 My mother makes a killer homemade cranberry sauce. Or so I hear, as I’ve never actually tried it. All those bits of soft-yet-still intact cranberries hold less than zero appeal for me. I once thought this might be a food neurosis I’d outgrow, but after three decades, I think it’s safe to say that I am, and always will be, a jelly girl. One-hundred percent. Unfortunately, those store-bought, can-shaped cranberry jellies became equally unappealing to me as I grew older. 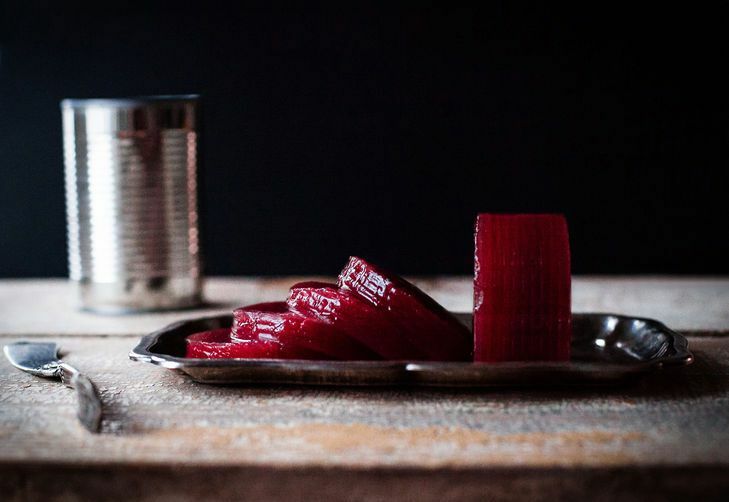 I’d accepted my fate of jelly-less Thanksgivings, but then Marisa of Food in Jars changed my life a couple years ago when she posted a recipe for a homemade version, set in a tin can. This recipe is super easy to put together, and the results are far better than anything you’d buy in the store. Cranberries should have enough natural pectin in them to set properly, but I prefer to use a little dry pectin anyhow, as I’ve had a couple jellies that failed to set in the past. I also like to add in warm spices like cinnamon, nutmeg, and cloves, but you can leave these out if you’re going for that true from-the-can flavor. 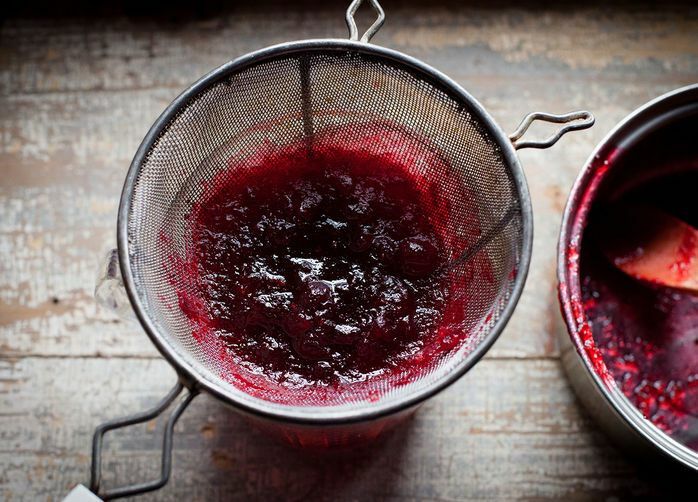 Bottom line: Don’t let the jelly lovers in your family settle for store-bought any longer. We’re worth it. Place cranberries in a medium saucepan. Mix pectin and spices into the sugar, then add the sugar mixture to the cranberries and stir to combine. Add the cider and lemon juice. Cover the can with foil or plastic wrap and let set in the fridge, for at least 12 hours. When it’s time to serve, run a butter knife around the sides of the jelly. If it still doesn’t seem to want to slide out, crack open the bottom of the can with a can opener. No need to try taking the whole bottom off—just a little bit of air should take care of the vacuum and let the jelly slide out easily. I'm a die hard Ocean Spray whole berry cranberry lover. Is there a way to alter this recipe to make it whole berries instead? Amazing! I made this for a Thanksgiving dinner this year. I had a backup can of the usual in the refrigerator, because my family are opposed to anything else. I had to really push to get them to try it, but everyone agreed it was far better than the can, but just like the can. I did put it in a mold, but won't make that mistake again. My daughter complained that one of her favorite things it to slice along the ridges. I had no idea. We are huge fans, and this will on our regular holiday menu from how on. As my husband and father-in-law love the canned version, we had the canned and this one side by side. Hands down, this one was all gone by the end of dinner. While the cranberries provided a nice tang/tongue feel, I might reduce the amount of sugar the next time. I made this for my dinner tonight and it was fantastic! I don't eat canned cranberry sauce and my husband will only eat that as he doesn't like the bits. This turned out perfect with just the right balance of sweet and tart that both of us loved. Thanks! This is such a great idea! 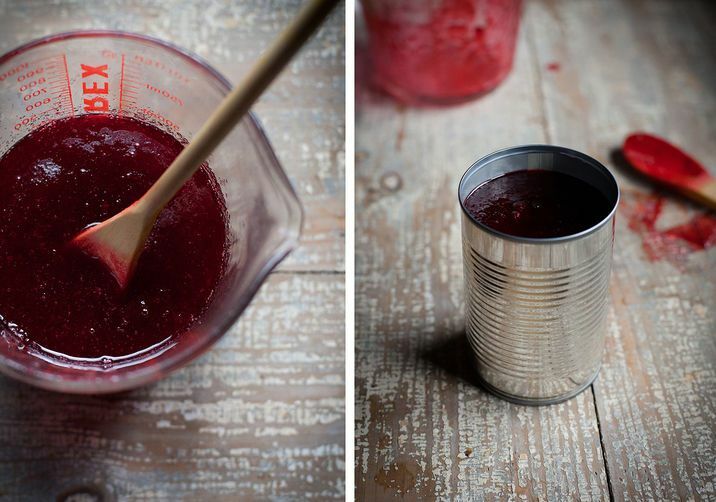 I used to love the jelly as a kid but started making the chunky stuff as a grownup. Will have to give this a try. What is all that stuff? Every 3 to 4 years, I buy 4 - 6 pounds of cranberries and put up jelly, plenty for the family and for gifts. For every pound of berries in the pan, add a cup of boiling water, and simmer 10 to 12 minutes until all the berries have popped. Run them through a food mill (after they've cooled a little), return the pulp to the pan, add 2 cups of sugar and a pinch of salt. 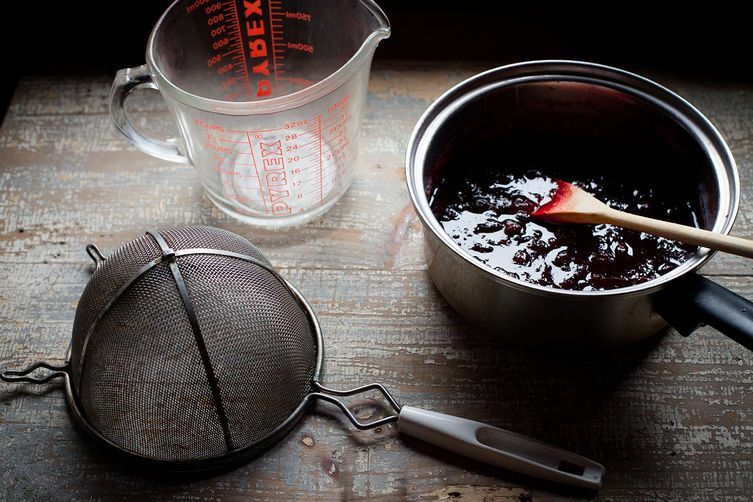 Cook and stir for 4 minutes and pour into jelly molds for immediate use (they'll keep for months in the fridge if covered with film) and pack the remainder in sterilized wide-mouth pints and half-pints using the standard open kettle canning method. I've been making this recipe for 50 years and have never had the product fail to jell, and never had a jar fail to seal. When you process the berries through the mill, you want the leavings to be fairly dry. I think this is the source of the pectin, thus making any addition unnecessary. I really can't imagine the addition of aromatics, I would like to taste it, but I'm not sure I would make the effort for something I might just pitch out. This is an amazing recipe. I am trying to get my family off the can. This may be the revolution I need. Thank you! I'm curious if I would like this version seeing I do not like it from the store. It really sounds good. Like many of you, I also grew up with this on the table, jiggling at me as I reached over it to get the mashed potatoes on my plate. My boyfriend insists on having this next week. Like a good girlfriend I bought it. I'm tempted, oh so tempted, to make this and put it on a dish and see if he'll notice. And even if he does, he'll eat it! Um, so I think you just changed my life. I too cannot seem to shake my love of jellied cranberry sauce, even as the rest of my food preferences have shifted to whole, homemade foods. What a perfect compromise. Thank you! 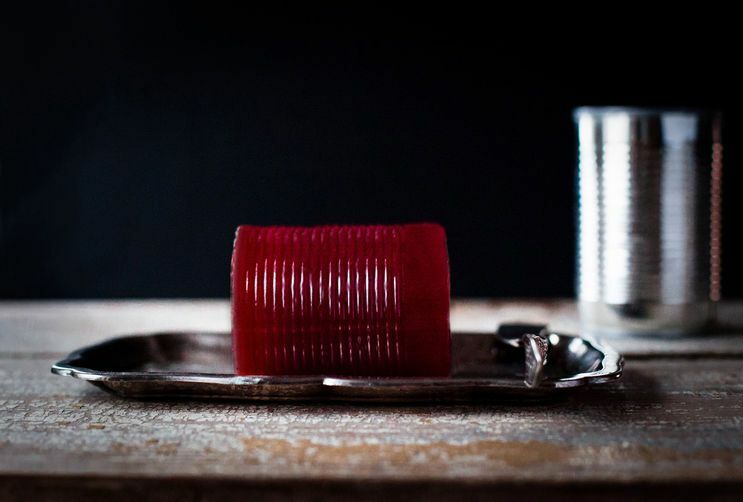 These photos are amazing -- you make canned cranberry sauce look more regal than it ever dreamed it could. I thought for sure these were Kenzi and Eric's photos!! Haha!Nice eye Carey! This is great. maybe I can trick my canned cranberry loving family members to eat this instead!